Nick Tropeano is a rarity in the Angels system. A young, inexpensive, good starting pitcher. But even he has succumbed to the terrible luck Angels starting pitching has suffered from this year. Three other young, inexpensive, good starting pitchers have already been shelved the majority of the year (Richards, Skaggs and Heaney) as well as C.J. Wilson. But Tropeano’s injury may make the difference between an Angels team being willing to reload for 2017 or rebuild for 2019. Losing Andrew Heaney was one of the most painful Angel injuries in recent memory. He won’t be back on the mound until 2018, and it may even be longer before he finds his groove again. Losing Richards has meant the Angels have lost their staff ace. There’s still a degree of hope that Richards’ stem cell therapy has worked, but if it doesn’t, he’ll be out until 2018 as well. If Nick Tropeano0’s elbow injury he sustained last night turns into the worst possible scenario, that will be three top starting pitchers out until 2018. Don’t get me wrong, it’s great that the Angels will get Skaggs back soon, and that Shoemaker and Santiago are pitching as well as they are and even top pitching prospect Nate Smith is pitching well in AAA. But Skaggs, Shoemaker, Santiago and Smith still won’t be enough to field a top notch, playoff caliber starting rotation. 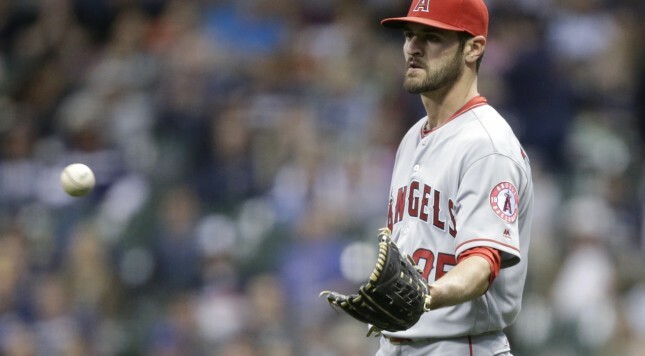 If Tropeano is indeed injured and the worst comes to fruition, the Angels would be smart to trade Shoemaker, Santiago, Escobar, Joe Smith and Huston Street all at the trade deadline. In fact, even if Richards isn’t healthy, and Tropeano is, the Angels still may be better served going through the dreaded rebuild.